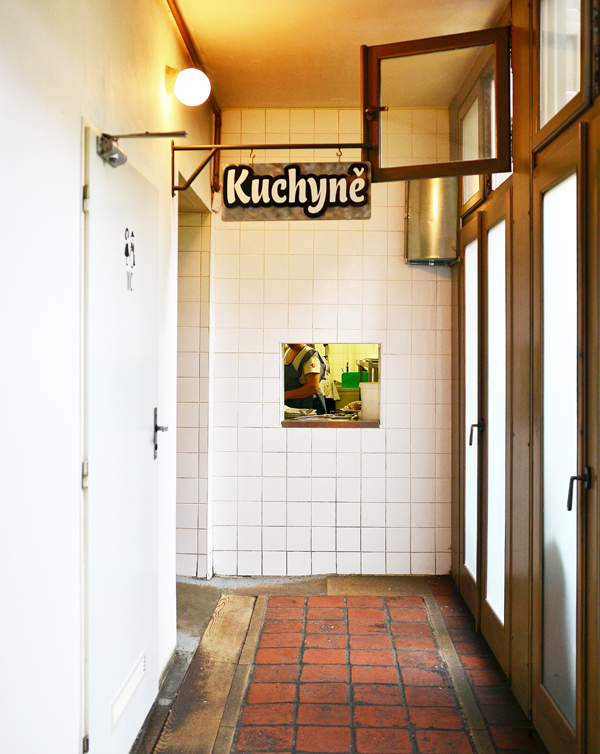 Our gastro-tour of Prague resumes, albeit on a smaller scale. So far, we’ve tried the city’s fine dining options, both traditional and modern. Yet between these feasts, we need to grab bites for lunch. With Prague’s central district being overcrowded with tourists, this is easy and difficult at the same time. Easy because you can find something to eat on every corner; it can make perfect sense to buy street food on the go, especially during the holiday season when the Old Town square and many other locations are hosting Christmas markets. Difficult because options are a lot more limited if you actually want to sit down (useful when you have a child in tow), eat Czech foods that taste good (what this blog is about, remember?) and aren’t too copious or heavy (on account of the rich dinners that await a few hours later), and yet stay clear of blatant tourist traps, all at the same time. That bit about lighter Czech food can be even more difficult in winter, when vegetables are scarce and meat and potatoes rule. But at least you can find reasonable portion sizes. So let’s take a look at a couple of options! I’d love to claim that Lokál is a small neighborhood hospoda that I discovered on my own while exploring the meandering streets of old Prague. Except… well, firstly, it’s now a chain of six restaurants (five in Prague, one in Plzeň), owned by the Ambiente group, just like La Dégustation Bohême Bourgeoise. And secondly, it’s mentioned in Lonely Planet‘s top itineraries. Still, there’s a fair amount (as in, more than 0) of locals (as in, people who speak Czech), compared to other places such as the one I’ll talk about next. The franchise we visited is the one in Malá Strana, and it’s technically named U Bílé Kuželky (At the White Skittle) because the facade is decorated with — guess what? — a white skittle, or small bowling pin, which I completely neglected to photograph. Regardless, all Lokál franchise locations share the same design concepts. 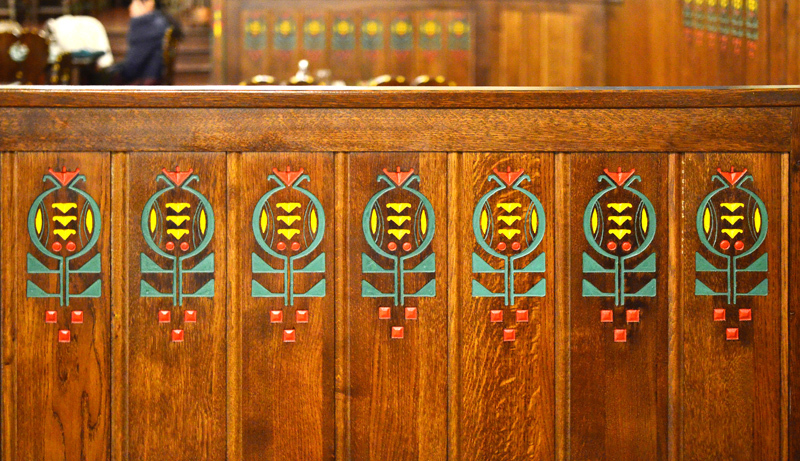 While the buildings can be very different, expect to find similar wooden panels with backlit drawings on the walls, and matching dark wood tables and chairs. 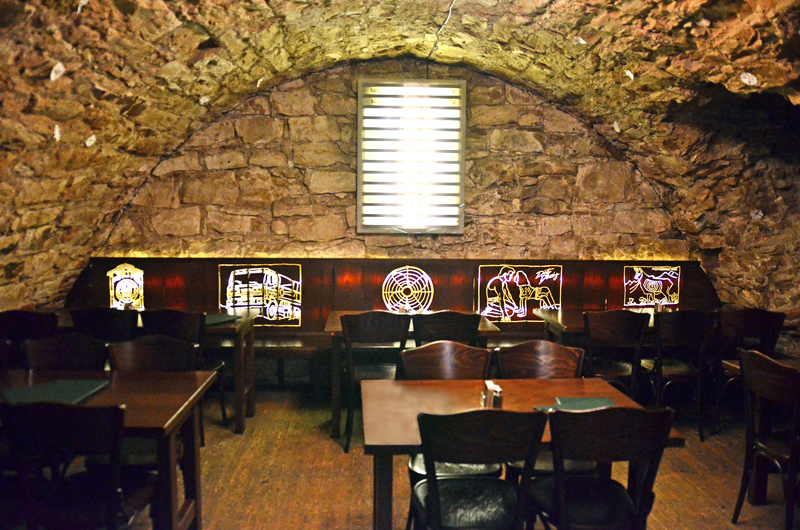 In Malá Strana, sit downstairs to enjoy the stone-wall vaulted rooms. The menus also look very similar across the chain, with about half of the same dishes, and half that might be changing with the seasons or rotating between the various branches. 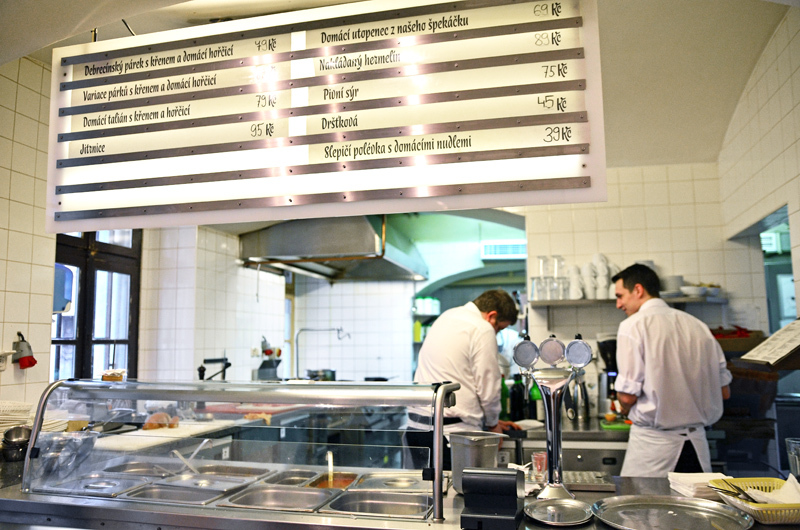 As often in Czech cuisine, the menu leans heavily towards meat. There are several kinds of sausages and cold cuts; roast beef, pork, and duck; steaks and skewers; schnitzels, cutlets, and chicken breasts. Still, vegetarians will find a few salads, and there’s a fish dish or two. The sides feature the usual dumplings, potatoes, and other starches, plus… tartar sauce. Not surprisingly, there’s a strong emphasis on beer. Like everywhere else in Czech Republic. The dishes arrive exactly as announced, without frills. In a sense, it’s refreshing to see a place that doesn’t try to clumsily embellish the food with a sprig of herb or a leaf of anemic lettuce that nobody eats! 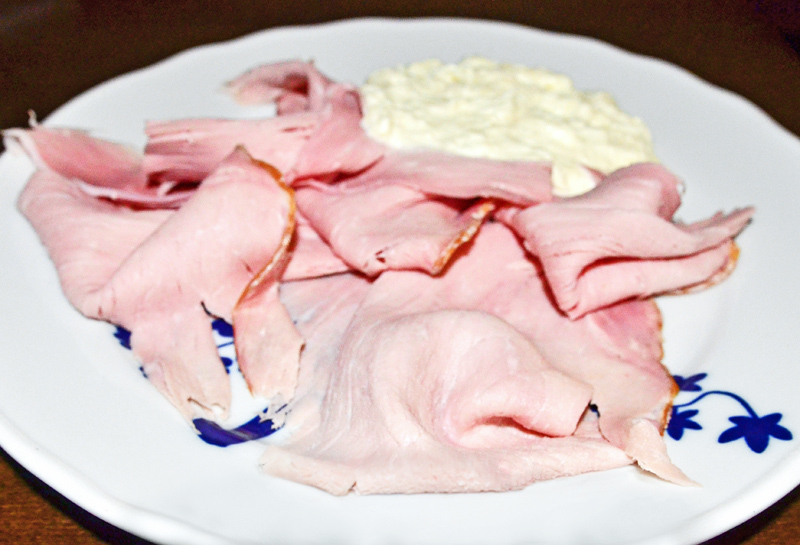 The Prague ham with creamy whipped horseradish consists of cold slices of roasted ham with a puddle of light horseradish cream on the side. This is very good ham nonetheless: very lean, with a good pork taste. 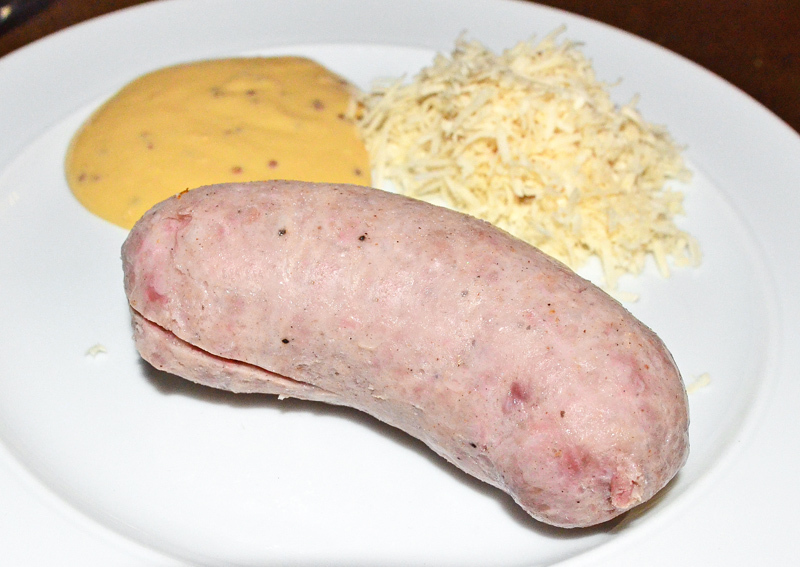 The sausages are all served with grated horseradish and mustard. 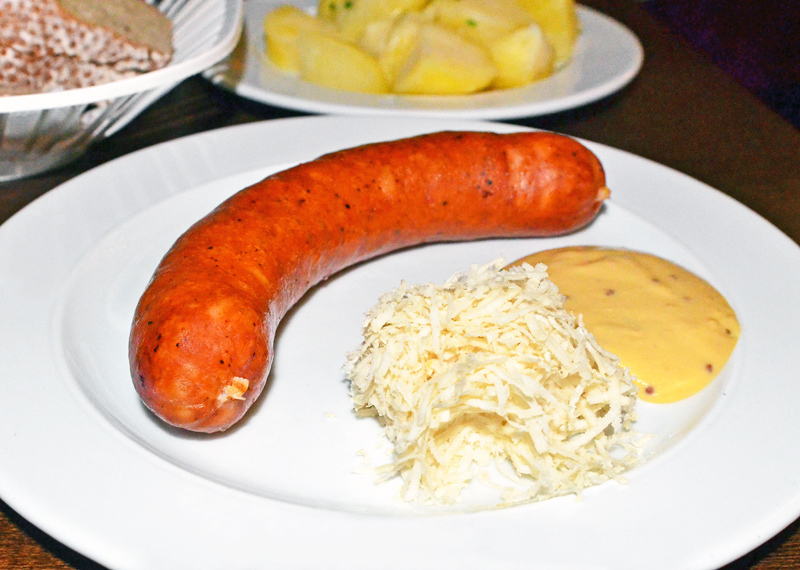 The excellent Přeštice sausage, hailing from the eponymous town in the Plzeň Region, contains very finely ground meat (pork and beef, I believe), almost like in an emulsion sausage, with just the right amount of diced fat. The Homemade Talián sausage is quite different. It’s a boiled pork sausage made of very coarsely cut meat and a small amount of fat. The result is pretty lean, not very salty, and quite good. It has an interesting history, too. Supposedly, according to this site, an Italian butcher started making this unsmoked sausage at the end of 19th century, and “Talián” is colloquial Czech for “Italian”. 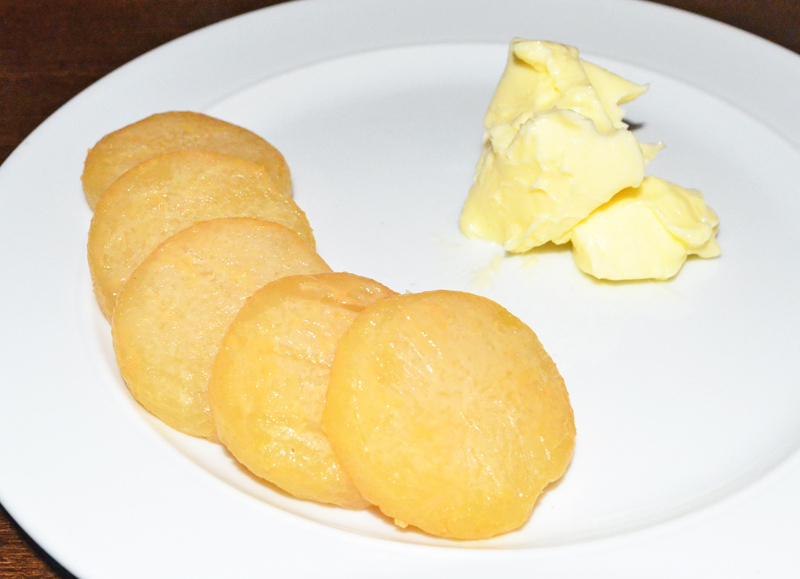 Try it with a side of boiled potatoes, buttered and sprinkled with chives. Finally, my daughter, ever the adventurous eater, got some plain palačinky, dusted with sugar. 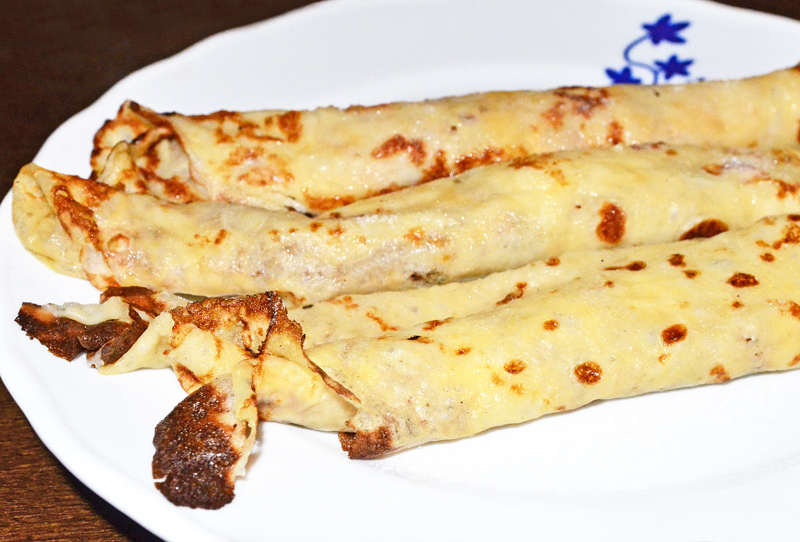 They’re homemade (duh), they’re good, they’re plain crêpes. Lokál boasts that their cooks “prepare classic Czech dishes, using only fresh ingredients and spices sourced from renowned regional suppliers”. It’s definitely a good place to try well-executed Czech specialties, and the simple food presentation means that you can order as little or as much as you want. There’s very little creativity, but it’s a good place to learn more about the local food. Plzeňská Restaurace must be one of the most touristy restaurants in town. 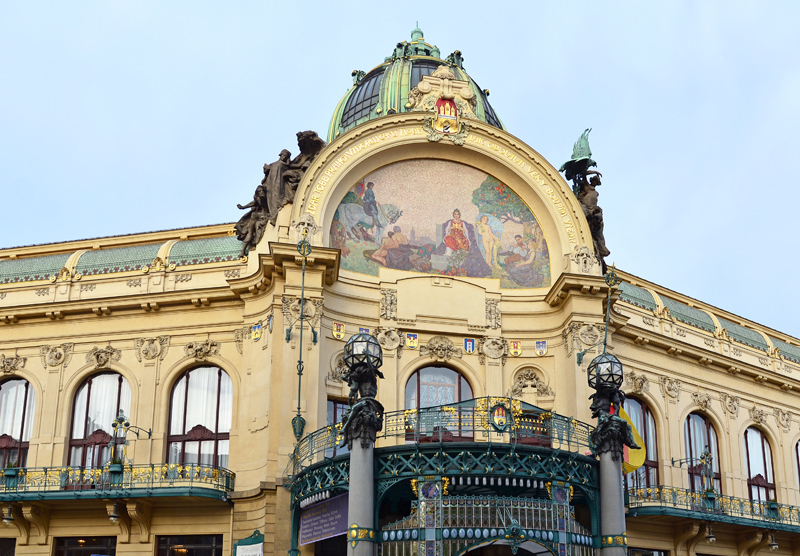 This is partly because it’s located in the Municipal House, an Art Nouveau masterpiece with sumptuous interiors that’s prominently featured in every single travel guide. 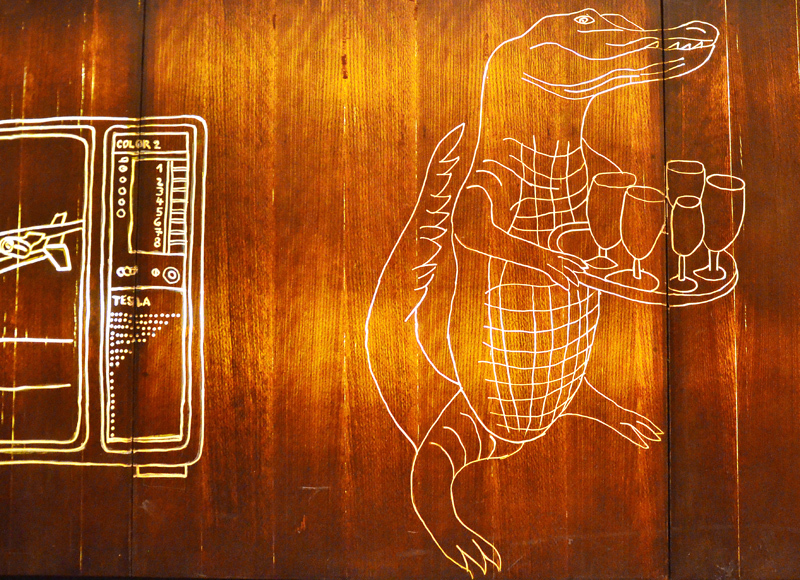 And what better way to admire these interiors than to have a meal there? 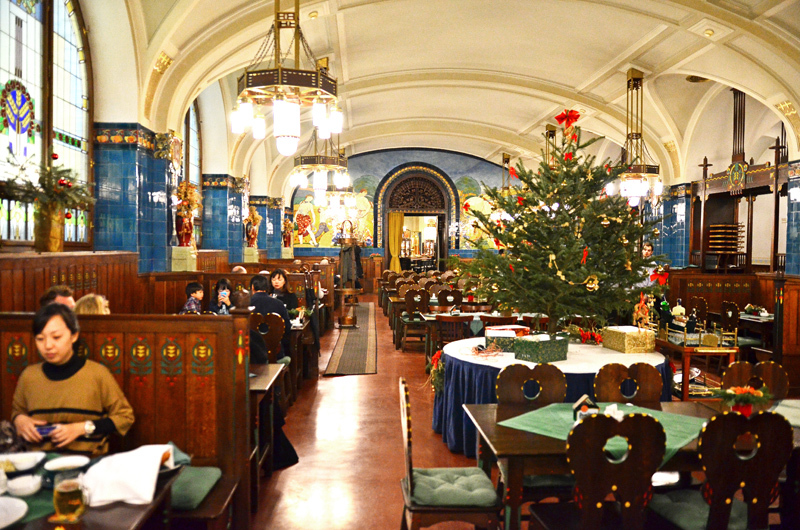 You’re almost guaranteed to not meet a single Czech in the dining room, save for the waiters, and the menu is written in 8 different languages, with pictures of recommended dishes. But what’s the food like? Not bad, as it turns out. Heavy options do abound at Plzeňská Restaurace. Just consider some of the chef’s six recommendations: classic Czech golden roasted duck (a whole duck, of course), roasted suckling pig ham hock, and the gargantuan classic Czech feast platter (judging by the picture, this includes a whole duck, four sausages, half a dozen thick slices of various meat roasts, enough bread dumplings to die by smothering, and four more traditional sides). Not to mention the potato pancakes fried in lard, fried Camembert (listed in the vegetarian section, no less), smoked fish, smoked meat, sausages, and goulash. But there are other options, such as the grilled pike-perch with spinach and mashed potatoes, or six simple salads. 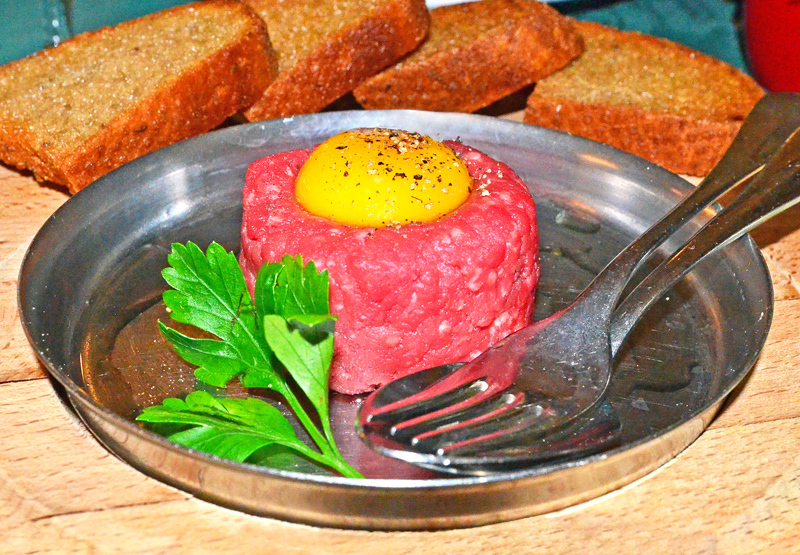 The beef tartare is both traditional and reasonably sized. You’re getting around 100 g of ground beef topped with an egg yolk. With the sprig of flat-leaf parsley, the dish matches the colors of the Art-Nouveau wainscoting, a detail that certainly hasn’t escaped the chefs. 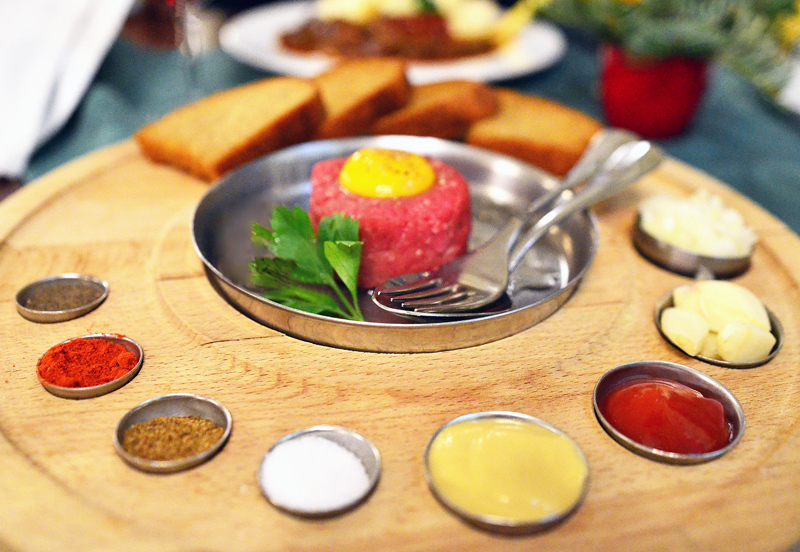 The tartare also comes with a dramatic presentation of the traditional accouterments. Counterclockwise: a mystery spice (allspice? ), paprika, caraway, salt, mustard, ketchup, garlic cloves (to rub on the bread), chopped onion (to mix with the beef). Prepare your own mixture, and eat it on a slice of generously buttered toasted. Very good. The Old Prague beef goulash, though not featured in a centerfold picture, is certainly a local specialty too. It tastes OK, but the meat could be more tender. 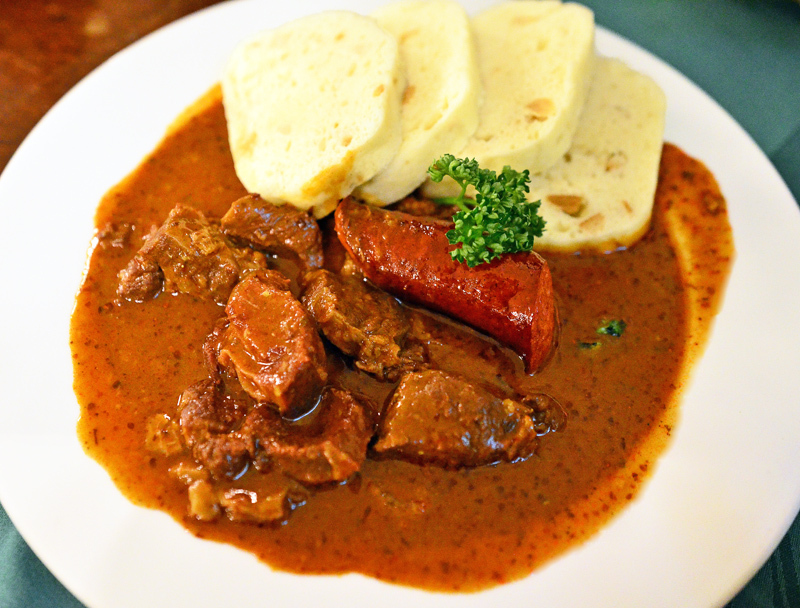 So what makes goulash, a Hungarian dish known as paprikás in its homeland, “Old Prague”? Easy! Half a pound of plain bread dumplings and a double serving of meat — in this case a piece of the usual nice-and-greasy, run-of-the-mill Czech sausage. Again, to remind us that we’re in a distinguished establishment and not just some greasy spoon, we get a garnish of curly parsley, strategically perched on the sausage for striking color contrast. To get an idea of the rest of the food, check out the restaurant’s web site for some attractive pictures. Is Plzeňská Restaurace a tourist trap? Not really. It’s a tourist magnet, and you pay extra for the decor. But it’s not outrageously expensive, and from my limited experience, the food is more than decent. Service is pretty mechanical but efficient. 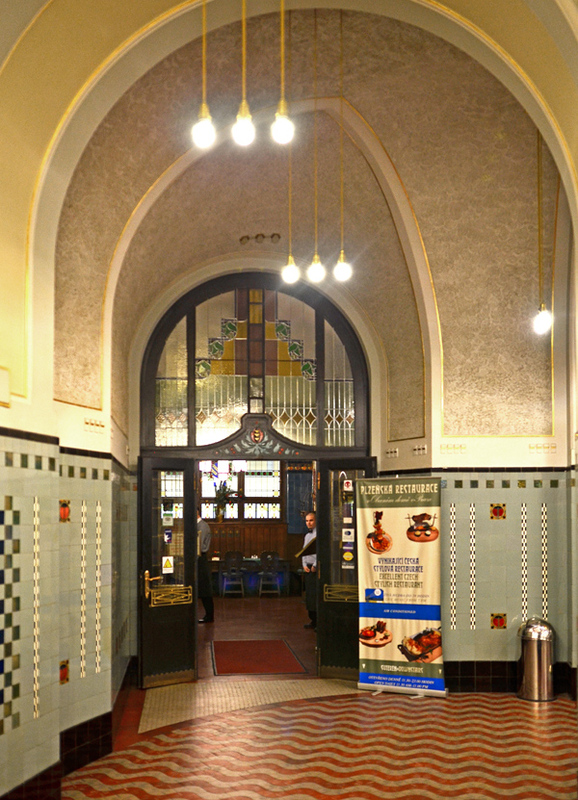 If you like Art Nouveau, I’d say it’s worth a visit, and it’s cheaper than the other restaurant in the Municipal House. I had a chance to sample all of those dishes and they were absolutely amazing! You brought back some good memories!